The unique architecture of George Town, Penang is made more colorful with the street art on its walls. Lithuanian artist Ernest Zacharevic created the first wall paintings of the town, and then more and more artists contributed throughout the years. The murals became some of George Town’s most iconic landmarks, and attracted more tourists wanting to take photos of them. I’ve visited Penang twice now and I’ve only seen a fraction of all the murals. But I think I’ve seen enough street art that, if you follow this guide, will be good for a whole day of walking. 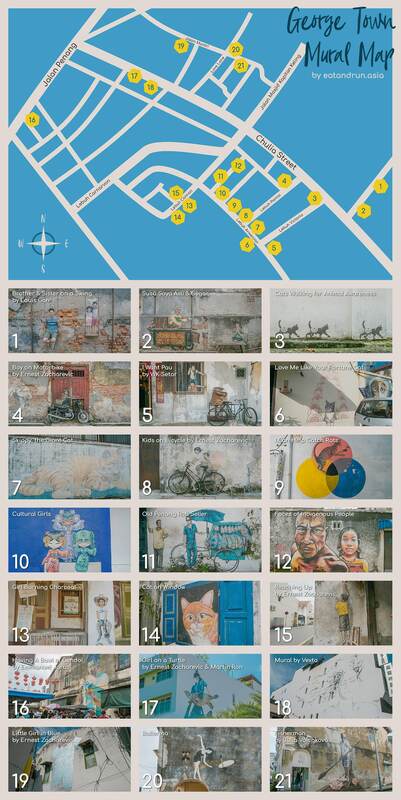 Please note that this guide is for George Town only, I’ve seen several great art pieces in Butterworth (in fact my favorite one is over there) but I don’t have enough to make a map out of it. Also, there are much much more artworks in the town than listed here, you may even see some just by casually walking by the street. The murals are all over and each one holds a special value for the place. This untitled artwork was one of the first ones I saw back on my very first visit to Penang. I instantly loved it, especially how big and conceptual it is. Unfortunately on my latest visit, it’s kind of fading already. I hope it gets a touch-up (or even a cover-up) by the same artist, Vexta. One of the interactive artworks where you can even stand on the swing to take a photo. It’s obviously heavily inspired by the works of Zacharevic, but what makes this special is that it was made by a local, Louis Gan. These scattered stencil spray of cats along a small alley are so cute. Penang’s famous Teochew Cendol was made more iconic with this mural behind the street stall. Everyone’s eating on a blue bowl just like the painting, and it greatly depicts the authenticity of eating a bowl of cendol in the middle of a street. A newer piece by Zacharevic with collaborator Martin Ron who has also done murals in Penang. What I love about this one is the dreamlike feel it evokes. It feels like the turtle is flying beside the building which makes it a little bit surreal and a lot more interesting. Don’t forget to download the map above! It can help in finding even the less famous murals hat deserve to be seen. You may also download it by click here. You might also want to check out out post about Popular Food and Restaurants in Penang here.